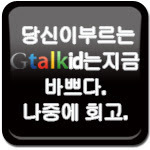 What is written in Korea letter, above Gtalk? Pazontaung has market selling ckicken and duck, right? တန္ရွင္နီဘုလြတ္ႏြန္း ဂ်ီေတာ့ခ္ အိုင္ဒီ ႏြန္း ဂ်ီဂြမ္း ဘာဘြတ္နီတာ.